The Number of Cat Cafes Is Rising Dramatically in the U.S. These cafes often work with local cat rescues to promote adoption. There are about 20 cats at the Java Cats Café in Atlanta — including a new tuxedo girl with a stripe on her nose who’s been hiding under the sink all morning. That’s not an unusual number of felines for Java Cats, which opened in March 2017. Sometimes the cats go quickly. A cat once came in on the weekend, when Martin was off. By the time she returned the following week, the cat had been adopted. And they’ve had some cats adopted on the same day that they arrived. It is a revolving adoption door. Java Cats is the 1st cat cafe in Atlanta and the 3rd in the Southeast. They are looking to open another cafe just outside the city. There are currently 72 cat cafes in the United States, 44 of which have opened in the past year. And still more are about to spring into being — or, as in the case of the Mew Haven Cat Cafe in New Haven, Connecticut, are about to expand from a successful pop-up cat lounge to a full-fledged cat cafe. The idea actually started with the opening of the Cat Flower Garden in Taipei, Taiwan, back in 1998 and got a mega-power boost in Japan. Le Café des Chats, with 2 locations in Paris. Lady Dina’s Cat Emporium in London. Cat Cafe Melbourne in Australia. Cats Republic in St. Petersburg, Russia, which requires a “visa” (a roughly $7 visiting fee). The Cat Cafe Neko no Niwa in Singapore carries Alfie de Meow cat-themed jewelry (10% of the sale proceeds go toward a local nonprofit cat rescue group). And the Catmosphere Café in Chiang Mai, Thailand, has a space theme and “a cat cinema,” where you and the resident felines can kick back and watch horror or sci-fi movies. The idea behind the cafes is a simple one. The felines provide companionship for customers who are currently cat-less — maybe their landlords don’t allow pets, the family cat may have just died — or who are simply in need of some furry therapy after a hard day. 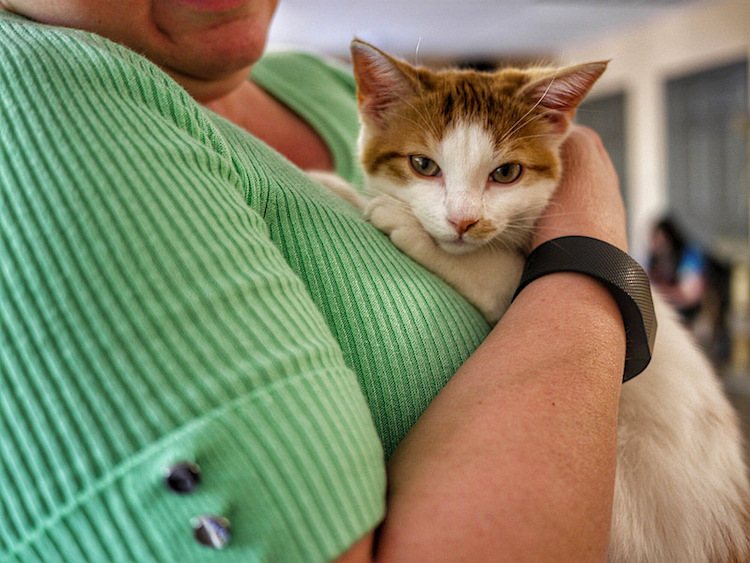 The cat cafes in the U.S. work with local rescue groups. Java Cats, for instance, is in partnership with PAWS Atlanta, a nonprofit no-kill organization. In fact, some of the regulars are PAWS volunteers. They “know what the environment is like, so they don’t send the cats who are easily unsettled,” Martin points out. Mew Haven Cat Cafe works with the Animal Haven, a shelter in nearby North Haven. As soon as they “can establish a timeline” for the renovations’ completion, they will contact the shelter, says co-owner Angela Pullo. By and large, the foreign cafes seem to be “more of a home for the cats who live there than an adoption center,” Martin observes. American health codes require that the cats’ living quarters be completely separate from the cafe. Both Java Cats and the Mew Haven Cat Cafe have separate doors leading into their cat lounges as well as large windows set in the wall between the 2 rooms. So you can still get your cat fix — albeit a milder one — from the cafe proper. And let’s face it: You can’t beat a good cat show. “Some of our long-term residents are unique in that they end up learning things like giving high-fives or standing on hind legs for treats,” says Martin with a laugh. 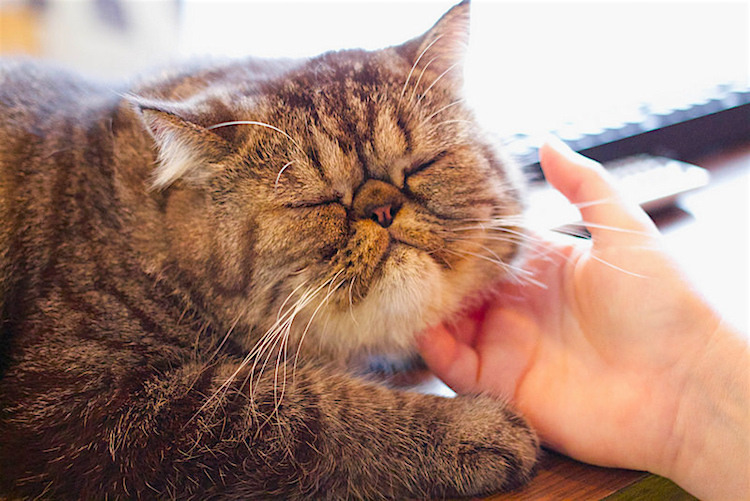 Most cat cafes tout themselves as a space to relax and interact with cats or kittens, but if you ask animal welfare advocates if cat cafes are good for our feline friends, their answer will likely depend on where they are located. Cat cafes in the UK and Asia are often criticized by animal welfare groups. Much of this criticism hinges on the assertion that cats should not be kept in close proximity with each other for long periods of time, especially with strangers cycling in and out. In most cases, these cats are bought and kept by the cat cafe and live there permanently. In this regard, they are seen as animals being used for the entertainment and profit of people. Indeed, not the hallmark of the animal advocacy movement. Meanwhile, in North America, cat cafes function primarily as off-site adoption centers for local animal shelters. Here, the creation of a cat cafe starts with the future cat cafe owner forming a partnership with an animal shelter. The cats are all still adoptable through their respective shelter, and in many cases the shelter will send adoption counselors to do adoptions at the cat cafe. If the cats get sick or begin to exhibit signs of stress, they are relocated to the shelter for care. Not every shelter environment is right for every cat. Some cats seemingly crave the socialization that goes with off-site adoption centers. Other cats are overwhelmed and shut down — they’re not the best candidates for an off-site adoption center, whether it’s a shelter event or a cat cafe. Cat cafes in North America are not exempt from the criticism that patrons cause stress to the cats or about the cats not getting along with each other. 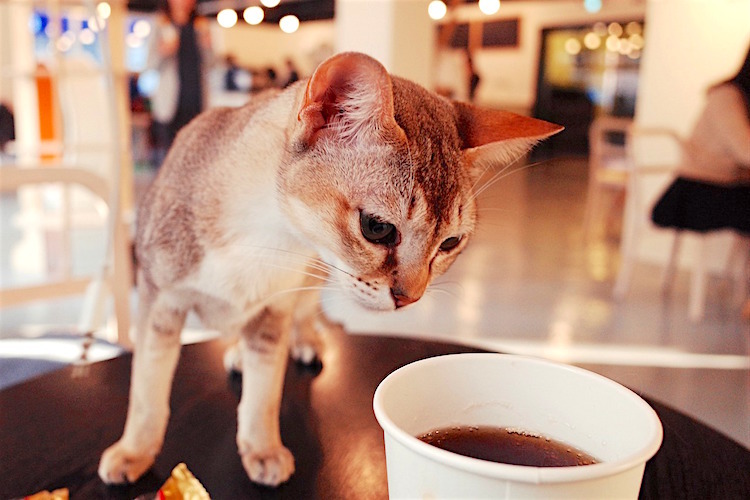 Most cat cafes — regardless of their location — enforce a code of conduct for patrons visiting the cats. While there still may be up to 15 cats living temporarily in an individual cat cafe in North America, the ultimate goal for each cat is adoption. If the cats were not in the cafe, they would instead be awaiting adoption at a shelter. North American cat cafes are typically nonprofit organizations and often take their animal advocacy to the natural next step by being completely vegan as well (with the exception of the cat food). 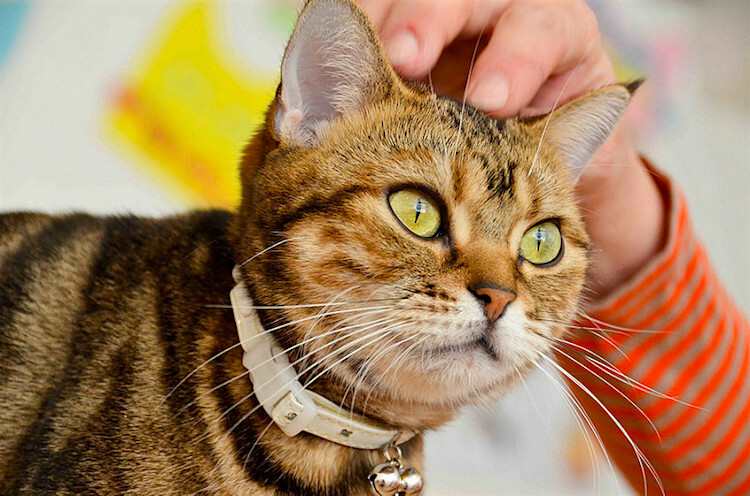 Cat cafes will often feature special events such as Purr Yoga, paint classes and even cat behavior workshops. One of the most common reasons cited for euthanizing shelter animals is lack of space. Cat cafes working in partnership with a shelter increase their city’s capacity to support the homeless animals in the community by adding 10–15 slots for cats to go at any given time. Even if the partner shelter is already a no-kill shelter, partnering with a cat cafe can reduce euthanasia in the respective city because no-kill shelters often pull animals from traditional municipal shelters when space is available. Even with the criticism in the UK and Asia, there is some pushback on the claim that cat cafes are harmful to animal welfare. While it’s easier to make that call on cafes featuring only specific purebred cats, some cafes acquire their cats through adoption from a shelter. In that regard, it can be a gray area. Despite this gray area, it is undeniable that cat cafes in North America are making a positive impact on the homeless animal population in the community. If you live near a cat cafe, go check it out. Who knows? You may come home with a new friend. 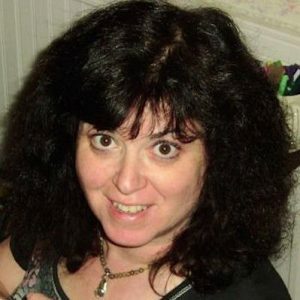 Kirsten Peek, a former adoption counselor at a no-kill animal shelter, contributed to this article.